Delete Expired Transients v2.0.5 has just been released. 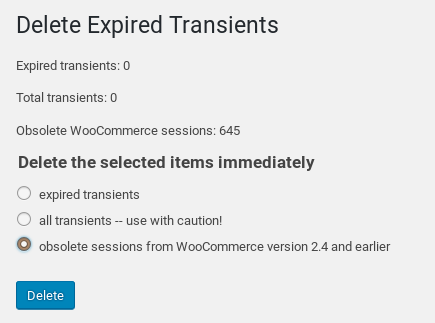 This release lets you manually delete obsolete sessions from WooCommerce version 2.4 and earlier. Before version 2.5, WooCommerce used to store shopping cart sessions in the WordPress options table in a similar way to transients. With the update to WooCommerce 2.5, sessions are now stored in a separate table for performance reasons. The update should have converted old sessions across to the new table, but sometimes it didn’t complete the task and left a whole lot of session records in the options table. Now you can easily delete those old, obsolete sessions with Delete Expired Transients. If you have the plugin installed, visit the Tools page for Delete Transients and delete away. You can update to version 2.0.5 from your WordPress plugin admin page. Here’s the full changelog for Delete Expired Transients.